Since most rides are stored this is the perfect time to stock up on some Spring modifications and service! We've decided to offer some great deals to the members as usual! Shipping is extra! SALE WILL BE ON FOR APPROXIMATELY 4-6 WEEKS! SHIPPING EXTRA! 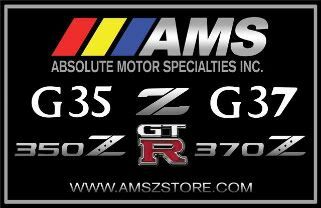 Re: AMS INC MEGA SALE - BRAKES, SUSPENSION & MORE! The brake lines, are they the same ones you had on sale last year? I assume they fit R32 as well as Z32? Yes, they are Z32 specific but are easily fitted onto the R32 as well. are you opening this sale up to gtrc aswell? unless its already posted there too..
looking at getting them for my 33 gtst. Last edited by cozmosland; 01-27-2011 at 12:04 AM.